Let's face the facts. There are few artists who wouldn't kill to record a new Lloyd Webber production number. The 20th century's most prolific producer of musicals and his collaborator, Jim Steinman, had no difficulty enlisting the glitterati to record pop versions of their operatic reworking of the classic Hayley Mills movie, Whistle Down The Wind. 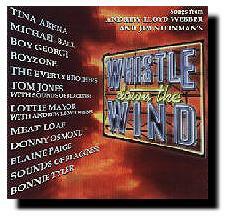 Established Lloyd Webber associates Elaine Page and Donny Osmond and Steinman proteges Meat Loaf and Bonnie Tyler lay claim to their numbers. Meanwhile, Tom Jones scoops Vaults Of Heaven, the show-stopper that actually opens the West End show. This full- blooded gospel belter is the best original song Jones has performed since the sixties. Leading lady Lottie Mayor and Tina Arena both perform spectacular versions of the title track and Boyzone have the million-selling No Matter What to add to their portfolio. However, the highlight is the uncompromising drama of Unsettled Scores: Michael Ball delivers a career-best vocal with this angst-driven opus, which displays the dynamic potency of the composers' partnership.